Beirgarten In West Village This Weekend!!!! Now there’s another reason to hang out in Campus Martius Park and Cadillac Square in downtown Detroit — free wireless Internet access. The free network is called Opportunity Detroit and is sponsored by Bedrock Real Estate Services, the real estate arm of the Quicken Loans business empire of entrepreneur Dan Gilbert, and the Southfield data center and IT services provider 123.Net. 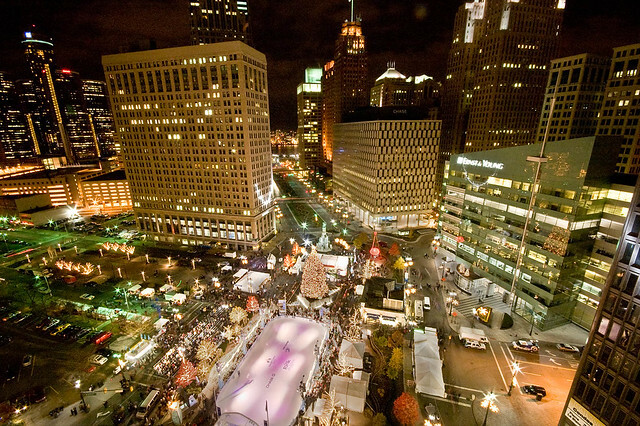 That means visitors to Campus Martius can now work or play on the Web while they check out the social scene. Visitors will also have access to this network in the lobbies of Rock Ventures’ adjacent buildings — the First National Building, Chase Tower and the 1001 Woodward Building. The jury is still out on whether the maker movement could bring about a new American industrial revolution. But anecdotal evidence suggests it’s well on its way to reinventing retail. Consider the craft maker whose merchandise got so much exposure through a recent Etsy-Nordstrom partnership that she and her husband both quit their day jobs to handle production and sales. Or take the math professor who sent his “rocket cup” design to Shapeways to produce a 3D ceramic tool for teaching students about paraboloids. After cup sales went gangbusters on Shapeways, a Fred & Friends wholesale order put it onto Urban Outfitter’s shelves. The Etsy seller is just one of more than one million shopkeepers using the e-commerce website to sell handicrafts and vintage goods to 30 million registered users in 200 countries, according to CEO Chad Dickerson. Detroit alone is home to 1,200 Etsy sellers. In New York City, they now outnumber yellow cabs. And worldwide, local Etsy sellers have joined forces in more than 7,000 self-organized groups, Dickerson claims. Shapeways, meanwhile, enables some 11,000 virtual shop owners to manufacture and sell their own designs by digitally delivering them to the company’s New York City 3D-printing factory and offering them in the Shapeways online marketplace, says co-founder Marleen Vogelaar. The platform enables members “to be entrepreneurs and have a life …producing beautiful, meaningful products” as well as to custom-craft unique, personal items such as wedding rings, she says. Dickerson and Vogelaar joined Detroit Creative Corridor Center director Matt Clayson and Ford’s open innovation guru Venkatesh Prasad for a “maker movement” discussion moderated by McKinsey & Company principal Lou Rassey at the Techonomy Detroit conference last week. 1. He was a winner. No matter where he went. The uniform may have changed a few times over the course of his 27-year managerial career, but Jim Leyland’s facial expression and ability to turn talent into a team certainly hasn’t. He won NL Manager of the Year twice with the Pittsburgh Pirates. He won the 1997 World Series with the Florida Marlins merely five years after the expansion team came into existence. And he helped a Detroit Tigers franchise that hadn’t had a winning season in over a decade become one of MLB’s elite teams. He is 15th in all-time wins and a coaching legend — and we’re running low on legends. 2. No one gets ejected like Jim Leyland anymore. Getting thrown out of a baseball game is an art form, and Leyland was a master at it. He stood up for his players and his team even when he knew he was wrong. Leyland’s tantrums have earned him a spot on the Mount Rushmore of hot-headed managers alongside Bobby Cox and Lou Pinella. Free Art Friday Detroit Brings Popular Art Workshop To The Heidelberg Project! This event brings The Heidelberg Project and Free Art Friday Detroit together in a workshop aimed to inspire the artist in all of us. All ages and skill levels are invited to create art on the most inspiring street in Detroit. During this workshop, attendees will create their own miniature versions of the homes that made The Heidelberg Project famous. Then they will place them respectfully around the city in the tradition of Free Art Friday Detroit. It's an incredible way for new artists to explore their creative side and share their love of art with the world. Workshop attendees will also have the opportunity to learn about the work of The Heidelberg Project and Free Art Friday Detroit while touring the famous Heidelberg Street. This event is free and open to the public. Guests must register to attend: https://heidelbergfafdet.eventbrite.com. Saturday, October 19 11 a.m. – 6 p.m.
Tour of The Heidelberg Project: 11 a.m.
Free Art Scavenger Hunt: 1 – 6 p.m.
Free Art Friday Detroit (FAFDET) is a free art scavenger hunt that was started in Detroit by Skidmore Studio in 2011. The mission of FAFDET is to promote creativity in the city, celebrate art in all its forms and encourage people to explore the great city of Detroit. The weekly public event is fueled by professional and amateur artists who donate their talents in support of this mission. For more information about FAFDET or to find clues to free art, visit facebook.com/FAFDET. Hatch Detroit and The Villages of Detroit are partnering up to present a Biergarten in West Village to introduce Phase II of the Detroit Lions Living For the City Neighborhood initiative, and our support of business on Agnes! Featuring several of our Hatch contest alumni including Batch Brewing Company pouring the beer, Alley Wine, Treats by Angelique and Voigt's Soda House. From October 14 to October 18, programming and leadership staff of DC-based Young Playwrights’ Theater (YPT) and Detroit-based InsideOut Literary Arts Project will meet in Detroit to create a brand new multidisciplinary art education curriculum that will be brought to classrooms in the two cities in the spring of 2014. My Art is So Loud: The 524 Project will allow high school students to rewrite the narrative about their cities and share their stories with students and adults around the country. The program curriculum will blend the strengths in both organizations’ curriculums to create a new, hybrid model that integrates poetry writing, playwriting and media arts. It will be implemented at Ballou Senior High School in DC and Western International High School in Detroit. These two classrooms will use iPad technology to teleconference and collaborate to create poetry, playwriting and visual art. This cross-disciplinary project will bridge the 524 miles between DC and Detroit, enabling students to begin a dialogue about how they relate to their hometowns and to create a new narrative of cities that are frequently represented to the world as centers of extreme poverty, high crime and violence. The project seeks to challenge perceptions and to build new understandings of Detroit and Washington, DC. YPT will broadcast the plays, poetry, and video art created by the students to a national audience online via tumblr and through live performances in DC and Detroit, empowering youth to reclaim their city’s legacy and to spark conversations about each city’s past, present and future. Once the program begins, the tumblr will be updated in real time, featuring video footage from the students in the classroom, performances of student work, photo sharing and behind the scenes interviews with the teaching artists, giving audiences the opportunity to follow the story of this experimental program as it unfolds. YPT was founded eighteen years ago, and has served over 11,000 students in the Greater Washington region in that time. This is the first time that the YPT model will be implemented outside of the DC area. YPT is able to implement this project thanks to the MetLife/TCG A-ha! Program: Think It, Do It, which empowers Theatre Communications Group members to take groundbreaking approaches to artistic, managerial, production and/or technological challenges and opportunities. YPT was one of three theaters in the country to receive a $50,000 Do It grant this year. It’s a great time to be a Detroit fan! There’s nothing more exciting than October baseball, so do not miss the Tigers as they fight their way through The MLB Postseason starting with Game 3 of the ALCS on Tuesday, October 15. This post is part of a series covering all four LCS teams. 1. With freezing weather, passionate fans, and one of the deepest outfield in the majors, Detroit has a serious playoff home field advantage. 2. Not to mention, Comerica Park is an absolute masterpiece. Here’s the full size image. Click HERE for the full list (it get's waaaaay better)! Detroit Makes Another Top Ten List. This One Will Make You Smile. It’s no secret that the city of Detroit has fallen on tough times. Its downtown core has fared much better than the surrounding neighborhoods, but still has its share of vacant buildings and a frequent dearth of foot traffic. Nonetheless, Detroit’s downtown is one of the most architecturally impressive in the country, largely because the city began to decline before others began urban renewal efforts. These efforts would ultimately scar the cores of those cities. Detroit’s downtown, then, is a remarkable architectural testament to pre-World War II styles of construction. It also remains a center of employment in the greater metro areas, and it has revitalized in recent years with the addition of restaurants and sports facilities. And you can’t forget the legendary automobile manufacturing meccas of Ford, General Motors, and Chrysler, the original symbols of 20th century American innovation. This Saturday! 3rd Annual Eastern Market Harvest Festival! 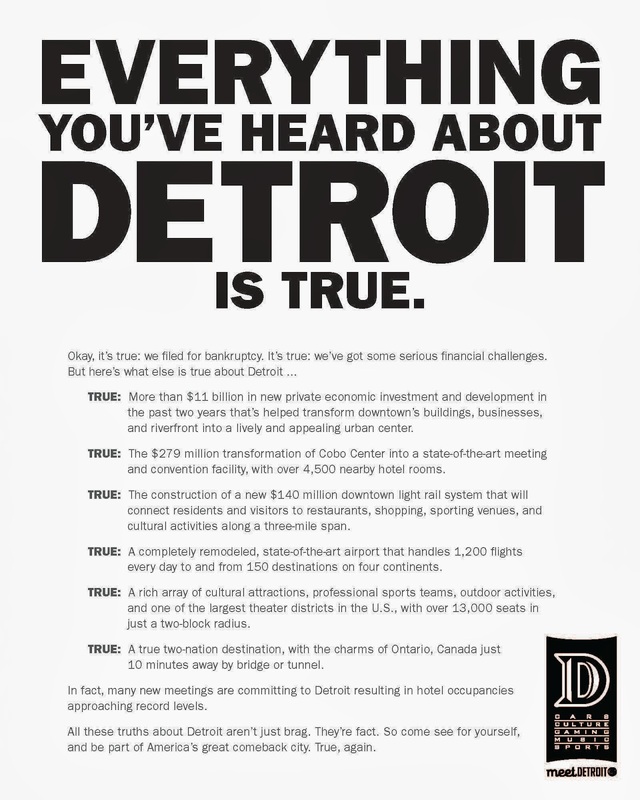 “Everything you’ve heard about Detroit is true” screams the headline in the most recent ad from the Detroit Metro Convention and Visitors Bureau. Risky? Not so much. Under that headline are some truths about the city. Here’s the rest of the copy. Okay, it’s true: We filed for bankruptcy. It’s true: We’ve got some serious financial challenges. True: More than $11 billion in new private economic investment and development in the past two years that’s helped transform downtown’s buildings, businesses, and riverfront into a lively and appealing urban center. True: The $279 million transformation of Cobo Center into a state-of-the-art meeting and convention facility, with more than 4,500 nearby hotel rooms. True: The construction of a new $140 million downtown light rail system that will connect residents and visitors to restaurants, shopping, sporting venues, and cultural activities along a three-mile span. True: A completely remodeled, state-of-the-art airport that handles 1,200 flights every day to and from 150 destinations on four continents. True: A rich array of cultural attractions, professional sports teams, outdoor activities, and one of the largest theater districts in the U.S., with over 13,000 seats in just a two-block radius. True: A true two-nation destination, with the charms of Ontario, Canada just 10 minutes away by bridge or tunnel. With that in mind the DMCVB also created tools for its planners that include a Detroit Perceptions and Realities document. Here are some the perceptions and the realities. A coordinated vigilance is present downtown and response times are low. For added assurance and responsiveness, the police emergency department has recently secured 100 new cars and 23 EMS units. Downtown is also blanketed with security provided by the pooled resources of Project Lighthouse, a public-private partnership involving Homeland Security, the Coast Guard, FBI, Customs and Border Patrol, state, county and city police departments, and all private security companies.